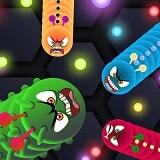 Huge worms in Angry Worms devour all around and struggle for superiority in the sizes. Battle also you about online players and do not leave to anybody and chance of a victory. Open new скины and allocate from crowd with the individuality.